BANGI, 28 Nov, 2012 – Academic and technical staff of the Faculty of Health Sciences (FSK) at The National University of Malaysia (UKM) should do fully-paid job attachments in the private sector or medical institutions to strengthen their skills before returning to the Faculty. They should also be considered for promotions or salary upgrades based on their work experience in the industry associated with their field of studies. The proposal was put forward by a group of FSK pioneers who talked about their roles in the formation of the faculty in 1992, at a forum to commemorate the 20thAnniversary of the Formation of the FSK, called Recollections of Two Decades of FSK. The suggestion came from four former and current staff of FSK, which at the time of its formation was known the Faculty of Allied Health Sciences (FSKB). The name was changed to just the Faculty of Health Sciences in 2010. 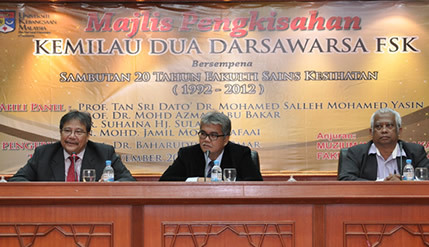 The forum was jointly organised by FSK and the Academic Heritage Museum of UKM. Panel members consisted of Tan Sri Dato’ Dr Mohamed Salleh Mohamed Yassin, the FSKB’s first Dean, Prof Dr Azman Mohd Abu Bakar, the second FSKB Dean, Dr Suhaina Hj Sulaiman, pioneering academic staff in the Dietetics programme and Mohd Jamil Mohd Rafaai, one of the first laboratory technicians. The forum was moderated by FSK Deputy Dean, Prof Baharuddin Omar. Also present was the Dean, Prof Dr Siti Zamratol-Mai Sarah Mukari. Prof Mohd Salleh, the pioneering Dean from 1992 to 1995 said The FSK has come a long way from those early days when it lacked both staff and support. The challenge in the beginning was to find recognition for FSKB courses from the Public Services Department (PSD). He said the academic staff’s efforts to gain recognition got the government’s attention when Biomedical Sciences courses won accreditation from the Society of Bio-Medicine in the United Kingdom in 2000. He also recounted how difficult it was to procure lab and teaching equipment. Furthermore, he felt neglected because even rooms and space for teaching and offices were not assured. He remembered that they had to relocate several times at the main campus in Bangi and eventually to Kuala Lumpur even when the new premises were not completely ready. Prof Mohd Salleh jokingly reminsced about the complaints that he was bombarded with, including from Dr Suhaina, the current FSK Deputy Dean. She was not happy with the working conditions. However, he said things have chamged a lot since then and FSK is now well-established. Prof Mohd Azman also faced dissapointments in those early days due to shortages in laboratory equipment. However, he found a sympathetic ear in the government when Prof Mohd Salleh was transfered to the Malysian Qualifications Agency (MQA) of the Higher Education Ministry. Prof Azman’s pleas for more equipment received attention and the requested hardware started arriving sooner. Dr Suhaina, in turn, brought a more personal side to the experience. She said she wanted to start her career working in a hospital as a Dietetician, an expert in food and nutrition, after completing her studies at Illinois, USA. She had dreamt of becoming a doctor, but now she finds her task exhillarating and fulfilling. As for those whose job was to set up the equipment, Mohd Jamil was one who did not mince his words. He spoke plainly of the challenging early days when there was a shortage of staff. There were times, he said, when he had to do the job of three people all at once. He was often called at short notice to assemble experiments for classes, but he did his best. Now a pensioner, he has a small business which he partners with his son in Kuala Lumpur. The panel members all agreed that research and development at the FSK should be stepped up to aid the nation in developing a fully-fledged Bio-Medical Industry like in the industrialised nations. They proposed that the private sector be allowed to play a bigger role in the faculty either through investments or training for internship at the Bio-medical labs. While the internships had already started, they hope to see graduates finding it easier to get jobs in the private sector instead of becoming too dependent on the government for employment.